So what is the immersive Excel experience you say? 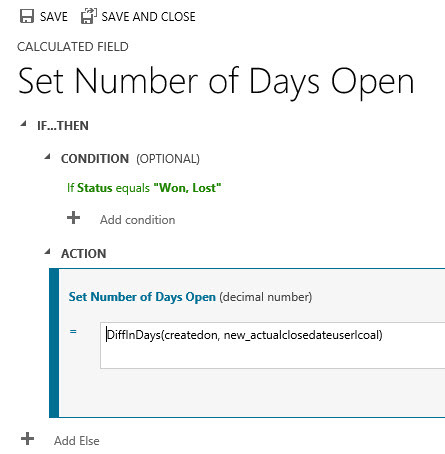 Well imagine you are working with a list of records and you want to do a quick sum or ad hoc calculation on the values, you can now open in Excel Online inside of Dynamics CRM and perform the action that you want to do. You can even update the values and reimport in if you have the right security roles. 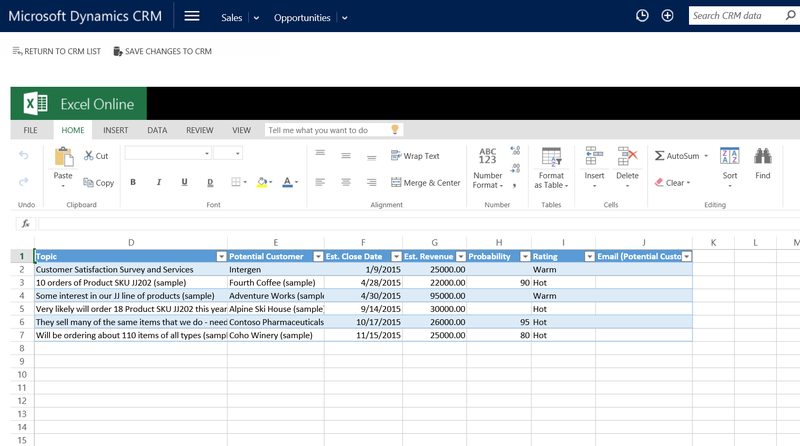 So basically select any view in CRM and then select export to Excel and select Excel Online. Now you have it in Excel you can manipulate the data. In the example below I have summed up the estimated value and have added a Pie Chart for effect! 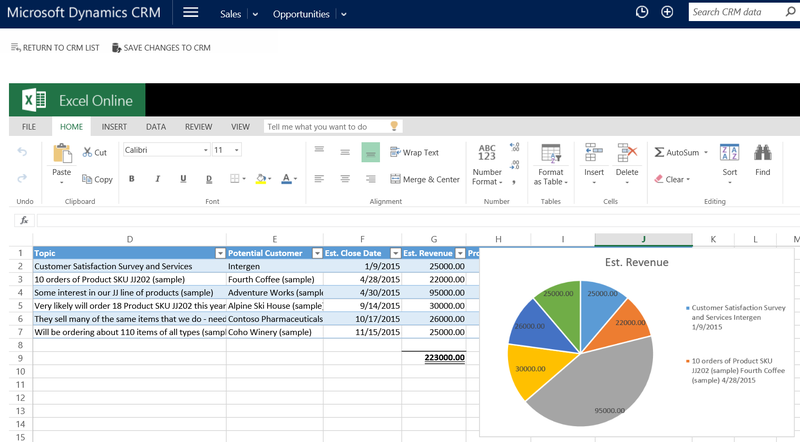 Finally If update the Probability of my opportunities, I can simply select Save Changes to CRM button above the Excel logo and import the changes into CRM, easy. One thing to note if someone else has subsequently updated one of the opportunities that I have updated in Excel, that specific row will fail on the import, the online update will always win. Have you ever exported to excel to find that some of the column formats that were exported did not match the type of record in CRM? Well in the Spring Release Update 1 this has been fixed. So what’s new? The table below details the new CRM data format mapping to Excel. ** Excel does not native data type to show date + time in one cell, as a result, only date is visualized in Excel for a date-and-time data. How do you as a business manage Service Level Agreements (SLAs)? How can you utilise Dynamics CRM to manage multiple SLAs against a Case and monitor the performance against them? This post will discuss the ins and outs of setting up and working with SLAs from a business perspective. 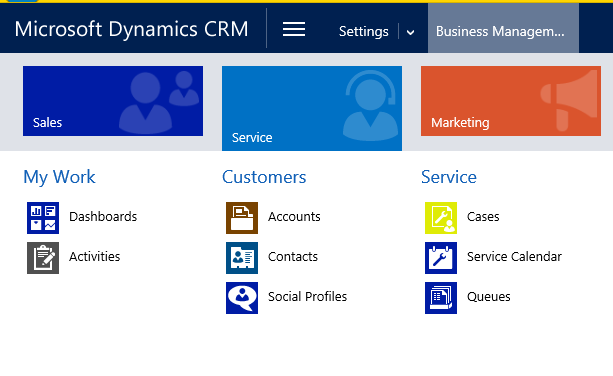 Dynamics CRM 2015 provides the ability to manage Sales activity, Marketing activity and Service Activity. This post will focus on Service activity with a customer and specifically related to creating and managing SLAs. – Based on any other attribute related to the Case or associated records i.e. Customer details, product details etc. As an organisation, you want to measure your levels of service to ensure that you are performing well against them and ideally meeting them. If you are not meeting them you want to be able to monitor why you are not i.e. is a particular team or user, or customer type or product type that is the issue. Dynamics CRM 2015 enables you to both create multiple SLAs aligned to any attribute, channel or entitlement and monitor through views and charts on how you are performing against them. I will now walk through the components that make up SLAs, how you create them, how they are executed and how you report on them. – Standard – standard SLAs were introduced as part of the CRM 2013 – Q2 2014 Spring release (Leo). They required a number of manual steps to get working, for example including in the warning actions updating the SLA status field appropriately, so that the timer field can behave as expected. – Enhanced – enhanced SLAs were introduced with the CRM 2015 release and removed some of the manual processes of the standard and introduced a number of new enhanced features. Note: It is recommended to only use one type in an implementation and not mix and match, for consistency and ongoing management. If you have not used SLAs to date it would be recommended to use the enhanced SLAs over the Standard SLAs. If you have used Standard and wish to move to enhanced, you have to recreate the SLAs. Please note you should consider how your data and views are set up currently to report on the data captured. – Entitlements – defines the agreed number of Cases or Time that has been contracted with the customer for support. Entitlements can only be associated to one SLA. An SLA can be associated to many Entitlements. 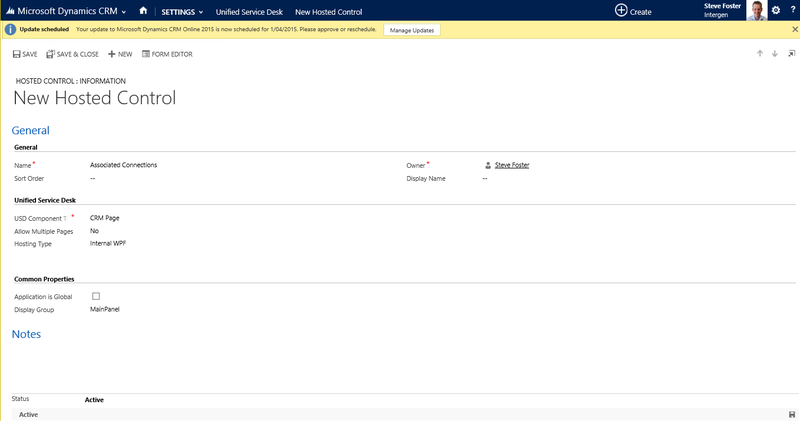 – Service Configuration – define which statuses place an SLA on hold (shortcut to System Settings). Note that the pause and resume statuses apply to all SLAs and thus are not SLA specific. – Holiday Schedule – defines the dates that are considered holidays in a particular region. If you work in multiple regions then you may have multiple holiday schedules. Holiday schedules can be applied to the Customer Service Calendar to be observed. – Service Agreements – define the rules that apply to the agreement, when a SLA is triggered, when and what should occur if the SLA is successful, non-compliant or nearing non compliancy. To create an enhanced SLA you need to have first created your customer calendar schedules if applicable so that they can be selected as part of the SLA definition. – If a customer does not have an entitlement what default SLAs should be applied? Only one default SLA can exist in the system, so all general SLA business rules will need to be included in the default SLA. – Should the SLA dates be calculated off the created or modified date? – Do we allow SLAs to be paused and if so what statuses are permitted? – How will my SLAs be structured? I.e. by product, by customer segment, by customer value, by type of case, by entitlement type, by priority / severity. It is crucial to have consistency of rules so that you and your customers understand how they applied. – What should happen if an SLA is nearing the warning time or failure time, what processes should be initiated on failure for example and does it depend on the type of SLA? Once you have determined your business rules you are ready to configure them in Dynamics CRM. 8. To enable the Success, Warning and Failure actions, you need to first save the record. 9. Repeat step 6 for each business rule. An SLA can include multiple business rules. If this will be the default SLA you will need to include all the default SLAs rules in this one SLA as only one SLA can be defined as default i.e. not associated to an Entitlement. 10. In my example I have defined multiple First response by and Resolve by KPIs by Customer category. Note: Only one SLA can be defined as the Default. Now that the SLA has been activated, any new Cases that meet the criteria will have the SLA applied. The screenshot below is of a Case related to a premium customer. You can see two SLA KPIs created for First and Respond by SLAs, the applicable countdown timers and the details if the case has been on hold. The timers will automatically change colour from black to orange to red and to Green based on the warning, failure and success criteria. Note: The Last hold date and minutes are not displayed by default on the Case form. You will need to add these to the case form to view them. Each SLA that is triggered against a case is reflected as a workflow on the case. The clauses that you defined based on trigger for success, warning and failure are converted in Wait and If conditions. So if we take a look at the workflows associated to this case we will see two workflows and if we open one up you will see the conditions as defined in setting up the SLA depicted in workflow logic. It’s a great place to look if for some reason your expected SLA KPI is not working as expected. So we have discussed creating an enhanced KPI for the standard First Response by and Respond by KPIs, but what if you want to measure another KPI like for example Decision Date or Second Response by? 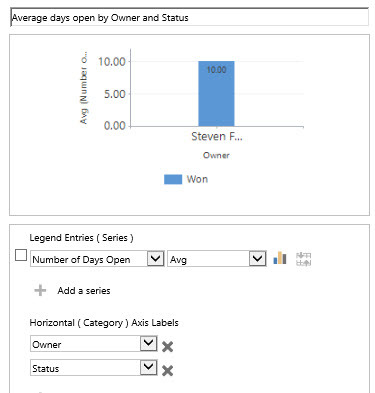 With Enhanced SLAs for Dynamics CRM 2015 you can now create your own KPIs. So what do you need to know? – The SLA KPIs are defined as lookups to the SLA KPI Instance, so by default there are two lookups one for Respond by and another for First Response by. 10. Once you have created the SLA item and activated it, you will be able to view the new KPI Decision date on the Case Form as per the out of the box KPIs. You can as many new KPIs as required, triggered on any condition. You can report on SLAs by using the standard views, charts and excel. One key point to remember when you are reporting on Enhanced SLAs, is that the key fields to be reported on are stored in a separate relationship SLA KPI Instance. You can report on any of the SLA date fields and review which cases are nearing non-compliance. You can create specific dashboards on SLAs so that you can monitor SLAs and performance against them. If you have CRM installed in an On Premise or Hosted environment (not CRM Online), then you need to be aware of a current issue with date calculations for non US based users. If you do not apply this fix you will notice that the date calculations for the SLAs may appear incorrect because of the date format being used. 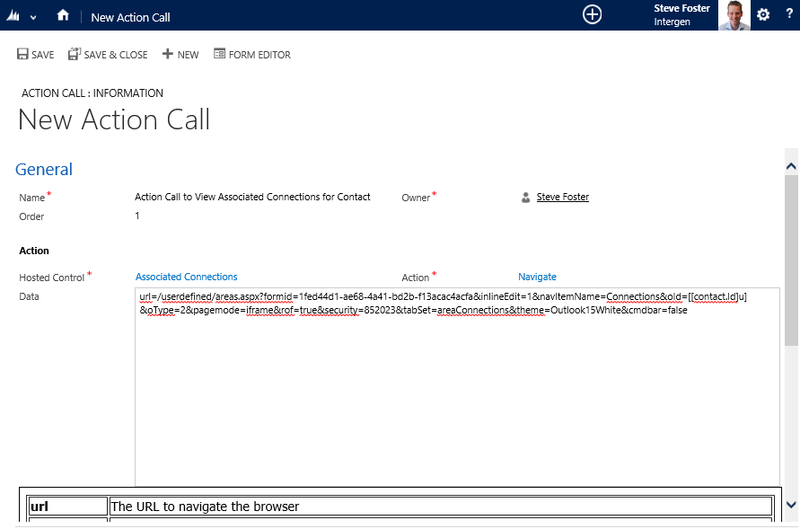 Unfortunately until a fix is applied to CRM you will need to ensure that the CRM servers running the web application are set to the US region as per this blog http://blogs.msdn.com/b/emeadcrmsupport/archive/2014/06/25/dynamics-crm-2013-and-date-time-not-rendered-as-expected-for-notes-related-to-case-records.aspx. Once you have applied this change then the dates will be calculated as expected. A detailed community support blog can be found here detailing some of the issues that other users have experienced with a reference to this fixhttps://community.dynamics.com/crm/f/117/t/129027.aspx?pi49829=2#responses.